Basilius Besler (1561-1629), was a reputable apothecary and botanist from Nuremberg in Germany. In 1596 he was appointed curator of the garden of Johann Konrad von Gemmingen, prince bishop of Eichstätt in Bavaria, who owned the only important European botanical garden outside Italy. The gardens surrounded the bishop’s palace, Willibaldsburg, which was built on a hill overlooking the town. The bishop commissioned Besler to compile a codex of the plants growing in his garden, a task which Besler took sixteen years to complete. Besler had the assistance of his brother and a group of skilled German draughtsmen and engravers. The work was named Hortus Eystettensis (Garden at Eichstätt). The emphasis in botanicals of previous centuries had been on medicinal and culinary herbs, and these had usually been depicted in a crude manner. The images were often inadequate for identification, and had little claim to being aesthetic. 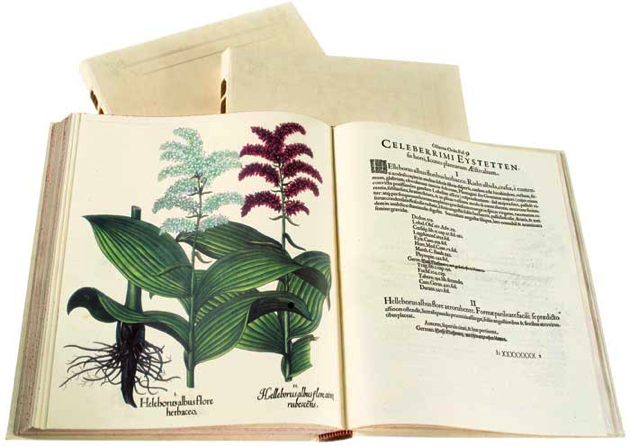 In case you missed it: check out the beautiful gallery of the Hortus Eystettensis and find out all the facsimile editions available on Facsimile Finder! The plates were of garden flowers, herbs and vegetables, exotic plants such as castor-oil and arum lilies. These were depicted in nearly life-size, rich detail. The layout was artistically pleasing and quite modern in concept, with the hand-colouring adding greatly to the final effect. The work was first published in 1613 and consisted of 367 copper engravings, with an average of three plants per page, so that a total of 1084 species were depicted. The first edition printed 300 copies, which took four years to sell. The book was printed on large sheets measuring 57 x 46 cm. The work generally reflected the four seasons, showing first the flowering and then the fruiting stages. “Winter” was sparsely represented with a mere 7 plates. “Spring” was a season of abundance with 134 plates illustrating 454 plants and “Summer” in full swing showed 505 plants on 184 plates. “Autumn” closed off the work with 42 plates and 98 species. Descriptions of the plants were in Latin and showed remarkable anticipation of the binomial system. Besler‘s portrait appears on the frontispiece holding a sprig of greenery, thought to be basil. Aboca Edizioni produced the fine art facsimile edition of the Hortus Eystettensis faithfully from the 1613 specimen in Eichstätt (SJ II 2892-2894, Universitätsbibliothek Eichstätt) on 170gr/m2 paper, specially milled for this edition. The effect of the printing process pressure is faithfully reproduced. It is a three volume opus containing 367 imperial folio plates (43.5 x 52 cm). White leather covers imitate every single detail of the originals. Limited print-run of 1450 copies. The commentary (286 pages, 29 x 38 cm, English, German and Italian languages) contains essays by K. W. Littger, A. Menghini, W. D. Muller Jahncke, D. Contin, W. Dressendorfer.